I'm a micro-business. It's just me - well, my wife helps out with invoicing now, but other than that it's all me and has been for a long time. I use Quickbooks to maintain my A/R and A/P and all that, but more recently I started using Mint also. While Quickbooks tells me everything I need to know about my business, Mint shows me my overall financial condition. That's important, because really that's what I care about. If I spent too much this quarter, it really doesn't matter if it was business related expenses or personal: the money is gone and seeing that in Mint is easy. I actually started using Mint in 2009. I connected my bank and investment accounts and my credit cards. 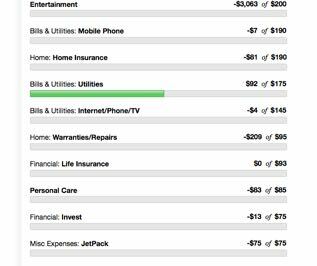 I looked at setting up budgets and realized that two things prevented me: one, I only had a vague idea of what our expenses actually are and my knowledge of our income was even more foggy. As that chart clearly shows, sometimes we spend more than we make and sometimes we don't. Whether it was too little net business income or too much personal spending doesn't really matter - that's the overall net. However, after collecting data all these years, Mint can now help me set budgets. This is a picture of part of this months budget. Notice the negative figures like -$3,063 of $200 for Entertainment? That's money we didn't spend. That is, I budgeted $200 a month, but we haven't spent that much and we now have a surplus in that budget. I could clear that away if I felt we are not going to use it this year, but in fact I know that we will use most of it: that's our vacation fund. If a negative figure gets too large and you want to use it elsewhere, enter two Cash transactions: one spending money in the category where too much has been carried over, and one as income against the category you'd like to bolster up. Business expenses are in that budget too. I could be specific, but I let Quickbooks break that all down and just carry the total here. I do the same on the income side; in Quickbooks I care about the source and type, but here it's just one lump figure. Both of these start off with a guess and get firmed up as the month progresses. 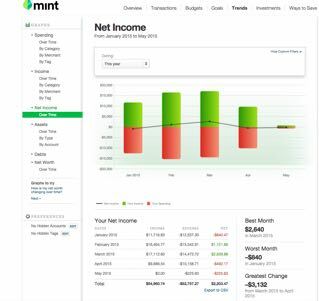 Mint now helps me see a bigger picture than my business financials can.